NBC 7 reports on the identification of one of those sailors missing in the collision involving USS John S. McCain. 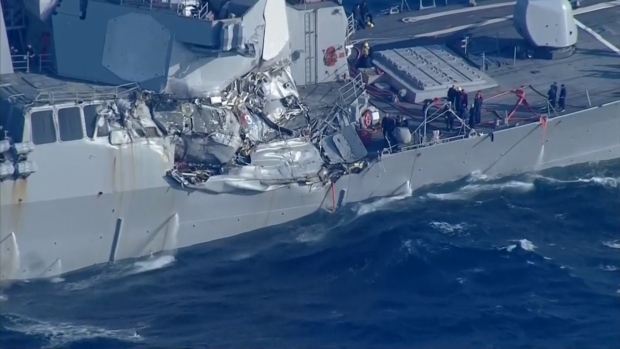 Since this report, officials have identified all 10 sailors killed in the collision. 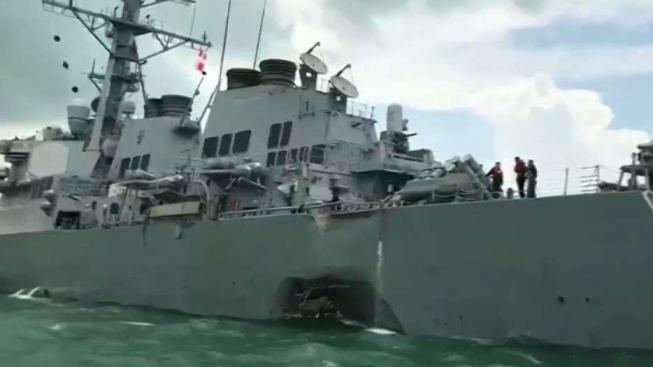 A second victim of the collision between the USS John S. McCain and an oil tanker near Singapore was identified by the Navy on Friday. The 7th Fleet said Navy and Marine Corps divers recovered and identified remains of 26-year-old Electronics Technician 3rd Class Dustin Louis Doyon on Thursday night. He is from Suffield, Connecticut. More divers and equipment arrived overnight to continue the search inside flooded compartments of the ship for eight others still missing. The Navy had called of the search of the seas on Thursday. Divers earlier recovered the remains of 22-year-old Electronics Technician 3rd Class Kenneth Aaron Smith from Cherry Hill, New Jersey. The USS Fitzgerald collided with a merchant vessel from the Philippines off the coast of Japan, causing major damage and flooding. The collision Monday ripped a gash in the McCain hull, flooding crew berths and machinery and communications rooms. The destroyer is now in port in Singapore. The commander of the 7th Fleet was fired this week after four accidents this year raised questions about its operations. The firing of Vice Adm. Joseph Aucoin, a three-star admiral, was a rare dismissal of a high-ranking officer for operational reasons. Eight sailors remain missing. They are: Charles Nathan Findley, 31, from Amazonia, Missouri; Abraham Lopez, 39, from El Paso, Texas; Kevin Sayer Bushell, 26, from Gaithersburg, Maryland; Jacob Daniel Drake, 21, from Cable, Ohio; Timothy Thomas Eckels Jr., 23, from Manchester, Maryland; Corey George Ingram, 28, from Poughkeepsie, New York; John Henry Hoagland III, 20, from Killeen, Texas and Stephen Palmer, 23, from Decatur, Illinois.